« IMPORTANT DATES FOR YEAR 6. Thursday 28th June – F2 Graduation in the hall beginning at 9.15am. No F1s in the morning. Graduation party in the afternoon. Friday 29th June – Records of Achievement will be sent home. 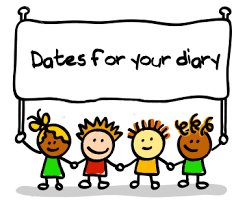 Monday 2nd July – Parents evening to view your child’s work and meet their new class teacher from 3pm to 5pm. Thursday 5th July – Y6 leavers play at 2pm. Friday 6th July – Y6s last day. Wednesday 18th July – Carnival Parade beginning at 9.10am to about 9.30am in the school carpark. The children from Y1 to Y5 will be parading as part of out school ‘TEAM’. Please feel free to stay and watch them after you drop them off for school. Start back – Tuesday 4th September.